Your house is many things: It's a place to raise your children, hold family parties, relax on weekends and, maybe, rent out for a bit of extra cash. But here's one thing that many economists believe it is not: an investment. That flies in the face of what you might believe. After all, if you buy your home for $200,000 and then sell it 15 years later for $270,000, you've made $70,000, right? That sounds like a good return on investment, but it's actually not. That profit doesn't include all the property taxes you've paid on your home, the interest you've paid on your mortgage loan, or all the money you've spent on maintaining your residence. The fact is, the only time a home might truly be a good investment is when you're downsizing or moving to an apartment after selling it. In a 2014 interview with USA Today, economist and housing expert Robert Shiller explained why consumers should not think of housing as an investment. From 1890 through 2012, home prices adjusted for inflation did not grow at all, according to Shiller's research. During the same period, though, stocks did. Shiller found that the S&P 500 increased by more than 2,000 times during those same years, adjusted for inflation. Shiller found that there have been long periods of time in which housing values when adjusted for inflation fell. He said that from 1890 through 1980, real home prices dropped by about 10 percent. Personal financial blog Observations also looked at inflation-adjusted housing prices from 1900 through 2012. According to these numbers, the average annual price for U.S. homes was just 0.1 percent a year after inflation. There are other aspects of houses that make them less-than-ideal as investments. The biggest? It's not easy to turn your home into cash. Sure, your home might have risen in value during the 10 years you've owned it. (Even if, as shown above, when adjusted for inflation, that appreciation might be negligible.) But accessing this appreciation isn't easy. You'll have to sell your home to get at whatever money it's made. Selling a home is no simple task. It's time-consuming. It's expensive, too, as you'll probably invest in everything from fresh coats of paint to major appliance repairs before you put your home on the market. And what if you don't want to sell your home? Then you won't be able to nab that cash. You can take out home equity lines of credit or home equity loans to tap the equity in your home. But you'll have to pay back the money you borrow, with interest, each month. If your home should lose value after you take out our home equity loan, you could end up underwater, owing more on your combined mortgage loans than what your home is worth. It's expensive to own a home. And that, too, makes housing a less attractive investment. Consider homeowners insurance. If you are using a mortgage loan to finance your house, you're required to invest in this insurance. Even if you're not financing your home, you should take out a policy to protect yourself. Realtor.com estimates that the average homeowners insurance premium across the country is $952. Then there are property taxes. The U.S. Census Bureau said that in 2017 the average household was spending $2,149 in property taxes. Finally, there is maintenance. This will vary, of course, but Realtor.com says that you can expect to pay from 1 percent to 4 percent of your home's value in maintenance each year. If your home is worth $200,000, that comes to between $2,000 and $8,000 a year. 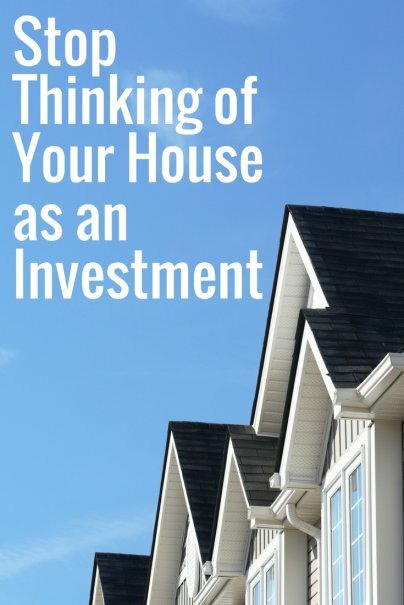 If you do sell your home for a profit, you need to factor in these costs of ownership when patting yourself on the back for making such a wise investment. This doesn't mean that buying a house is a bad financial move. You do have to live somewhere, and depending on where you live, it might be less expensive to own a home than it is to rent an apartment. Owning a home also gives you some financial flexibility. You can rent out a portion of your home, for instance, to earn additional cash. You'll also be able to claim tax write-offs for the interest you pay on your mortgage loan each year and the property taxes you pay. Housing does provide this other benefits, too: shelter for your family, a gathering place for relatives and friends, and a respite at the end of a tough day. It's important to be realistic about housing's investment potential. If you want to invest, buying stocks or investing in mutual funds might be a better choice. Even low-interest, but safe investments such as bonds or CDs make more sense as an investment.